Tradition- and faith-oriented insider mediators or TFIMs constructively manifest tradition and faith in their peace mediation efforts. Intrinsic to a conflict context, they work from the inside to create the space and opportunity for transforming conflict. They are able to do so due to their respected position and legitimacy in society, inside knowledge, personal relationships to the community and their commitment to engendering peaceful coexistence. Who are TFIMs and why are they important? Tradition- and faith-oriented insider mediators are traditional and religious authorities or leaders, and civil society actors, who incorporate traditional and religious elements in their conflict transformation efforts. A TFIM may draw tools and inspiration from multiple faiths, cultures and traditions, as well was from non-religious and non-traditional values. 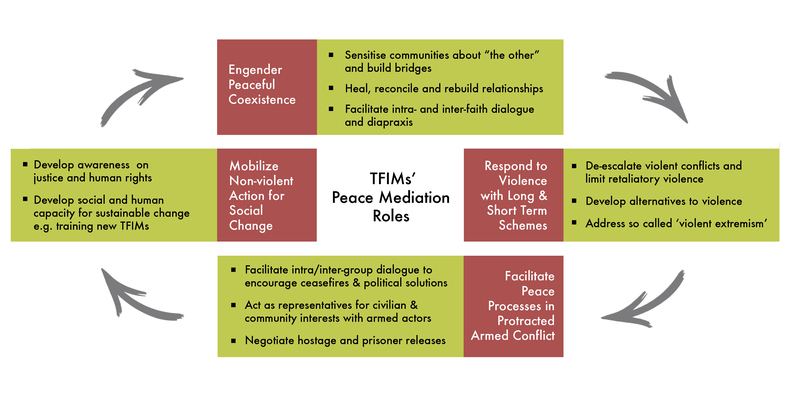 As national and internal actors, TFIMs often work behind the scenes and use their influence to constructively transform the behavior and relationships of conflict actors. Using facilitation, dialogue and mediation, TFIMs are able work horizontally and vertically, formally and informally, at local, regional and national levels. Examples of TFIMs include: individuals who represent religious institutions, such as bishops, muftis, abbots and rabbis, and spiritual or traditional leaders with authority or influence at an international, national or local level. TFIMs also include tradition- and faith-oriented community and civil society actors and entities, such as NGOs and FBOs. The strength of TFIMs lies in their dual position as both representative of the grassroots level as well as an authority with the ability to participate in national and international discussions. The unique position and the inbound trust of TFIMs often give them more legitimacy than other actors (e.g. national or international political actors) to mediate conflict. Due to their position and ability to encourage and engender conflict transformation from within communities, TFIMs have the possibility of taking transformative roles in peacebuilding and conflict resolution. Does the inclusion of TFIMs in conflict resolution mean that the conflict is about religion? The fact that a TFIM takes a role in peacebuilding does not mean that a conflict is based on religious disputes. Faith, spirituality and tradition can exist without being rooted in religion, and TFIMs may not necessarily draw on one particular religion or tradition in their mediating tools. TFIMs can influence people’s opinions and perceptions by re-humanising the ‘other’ on the basis of traditional and religious values such as justice for all, forgiveness, harmony, and human dignity. TFIMs often constructively challenge and address blind spots of predominant religious and traditional practices and succeed in evoking paradigm shifts in people´s attitude and behaviour. The approaches to mediation adopted by religious peacemakers are thus not necessarily ‘religious’, but often more similar to ‘secular’ approaches used by other kinds of peacemakers. To add to peacebuilding efforts, TFIMs may also serve as ‘indirect connectors’, facilitating the involvement of neutral outsider mediators in cases where they themselves lack sufficient trust and credibility among conflict actors. Supporting the capacity of TFIMs creates the possibility of using faith- and tradition-based tools in order to build sustainable peace. How to support and strengthen TFIMs? The first step in supporting and strengthening the work of TFIMs is to recognise the work done by TFIMs. To add to this, it is important to expand and strengthen the role of female and young TFIMs and to provide opportunities of learning and knowledge gathering both within the local context as well as in the international level. As a first step, we welcome you have a look at our TFIM Resource Base.